I have read that they are not even bronze, but rather “fused iron.” Since the only metallurgist I know is too busy smelting at the moment to explain the difference to me, I shall continue to call them “bronze” just the way Neapolitans do —quite simply, they are the cavalli di bronzo, the “bronze horses.” The term refers to the two statues mounted on the pillars of the east entrance to the gardens of the Royal Palace in Naples. That is not exactly an out of the way spot, but the average tourist gaze is likely to sweep past it and focus on the huge Maschio Angioino castle right across the way; thus, people tend not to pay too much attention to these statues—to my knowledge, the only obvious chunks of Imperial Russia on display in Naples. 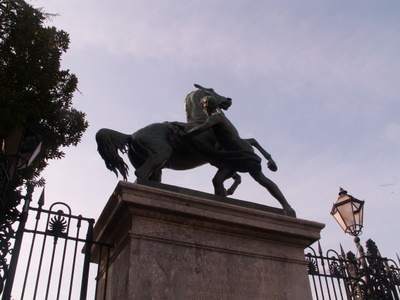 Rightly, the statues are called i domatori di cavalli—the horse tamers. They are the work of Russian sculptor Peter Clodt von Jürgensburg (1805-67) and are similar to two of the sculptor’s four statues on the Anichkov bridge over the Fontanka river in St. Petersburg. Strictly speaking, the Neapolitan horses are not copies, not replicas of the statues in Russia, but similar to them and, in fact, predate the ones on the Russian bridge. In the early 1840s, Clodt von Jürgensburg did the original four for the bridge, at which point Czar Nicolas I told the sculptor that he “made finer horses than any prize stallion does.” The Czar liked the statues so much that he gave them away as gifts: two went to Prussian King Frederick William IV and are still in the Heinrich von Kleist park in Berlin. 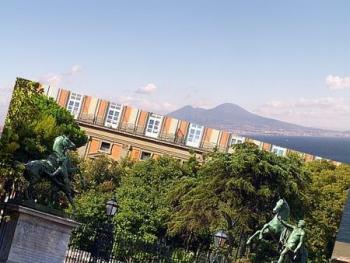 The other two came to Naples as a gift to Ferdinand II in 1846 on the occasion of a state visit by the czar to the Kingdom of the Two Sicilies. The sculptor then cast four definitive versions of his Horse Tamers for the bridge in St. Petersburg; they were installed in 1851 and are still there, having survived even the ravages of World War II. The horses in Naples are reared up; they look wild, as yet untamed, while the horse-tamers, themselves, are as naked as the horses. 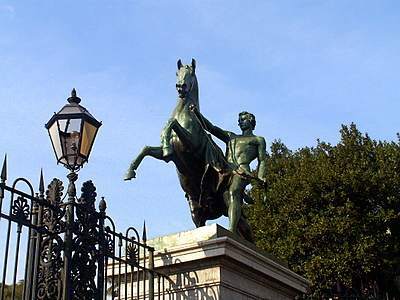 It all looks savage and somewhat “un-Italian,” —let’s say Russian and steppe-like —at least compared to other stately and totally tamed equestrian statues in the city (the two mounted versions of Charles III and his son, Ferdinand I in the square on the west side of the same royal palace, for example.) But the inspiration is very classical; the statues are variations of the colossal Roman marbles of Castor and Pollux, the Heavenly Twins, posed with their steeds at the fountain on the Quirinal Hill in Rome. The Horse Tamers in Naples were cleaned and restored in 2002 (which, incidentally, is the last time I have seen that particular entrance to the gardens open). There was a reason for the good relations between Imperial Russia and the Kingdom of Naples in the 1840s that impelled the czar to give away two of his prize monuments. Czar Nicolas’ grandfather, Czar Paul I, had signed Russia up in the so-called “Second Coalition (formed in 1798) against the forces of Republican France. The other members of the Coalition were Great Britain, Austria, Portugal, Naples and, surprisingly, Turkey (the Ottoman Empire). For a while, then, the Russian and Turks put aside their centuries of dispute to make common cause against the French. A joint Russo-Turkish fleet joined the forces of Admiral Nelson in the southern Mediterranean. The immediate goal was to dislodge the French-supported Neapolitan Republic (proclaimed in January, 1799) and reinstall the Bourbon monarchy to the throne of Naples. A body of five- or six-hundred Russians and Turks landed on the Adriatic coast, having crossed from Corfu, to assist the Royalist forces under Ruffo in retaking the kingdom. They were successful, and the Russian and Turkish commanders both signed the armistice agreement by which the Bourbons (in this case, King Ferdinand I) were restored in Naples. One grandfather had helped another, and both grandsons were now still absolute monarchs, still resisting the gathering forces of reform at mid-century. That’s worth a couple of statues. 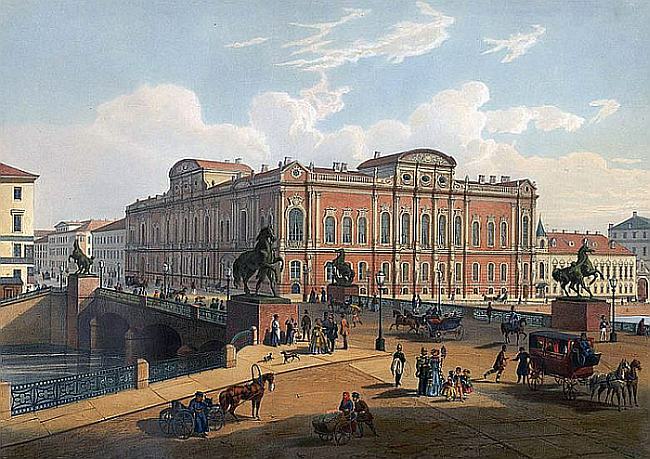 This is a 19th-century lithograph of the Anichkov Bridge in St. Petersburg showing the four horses.